We Mangi's (short form for Mangaloreans) love our Beef. Be it a roast, a spicy curry, a stew or a dry dish with coconut/ sukka. 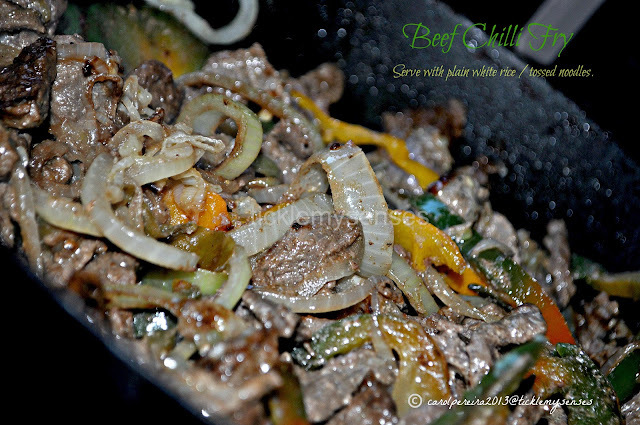 My favourite beef preparation by far would be the "Beef Chilly Fry". Every Mangalorean Catholic family has its own recipe for "Beef Chilly Fry". Most recipes tend to be hot and spicy and would involve cooking the beef in a ground spice paste of whole or ground varieties of chillies and or black pepper. 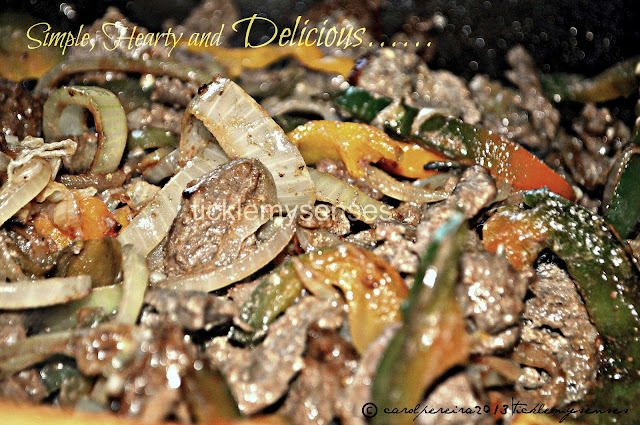 But my family's version of "Beef Chilly Fry" is quite different. It is more of an Indo-Chinese dish that is delicately spiced and bursting with fresh natural flavours. The sweetness of the onions and coloured capsicums/ peppers, with the gentle heat from a good sprinkling of freshly ground black pepper, the savouriness of the soya sauce and sourness of freshly squeezed lemons, creates a well balanced and wonderfully spiced succulent beef preparation that is irresistible and delicious. I happened to find tender garlic bulbs at the farmers market hence sliced up the whole garlic bulb for the stir fry, you could use regular garlic flakes instead. Do try this recipe, Bachelors you will love this recipe. I would love to hear how you enjoyed it , do drop me a line!! 1. Slice beef really thin against the grain, and then cut into thin long strips, remove all visible fat. 2. Mix marinade ingredients in a bowl, marinade beef strips in above marinade for 1 hr. 3. Place marinaded meat in a cooker without any water and cook for 1 whistle on medium -high flame, then turn down the flame and cook for further 10 mins on low.Turn off heat. Once pressure drops open the cooker and allow almost all liquid to dry by placing open cooker back on heat. 4. Prepare all the slicings while the meat is cooking. 5. In a wok or a big vessel take oil. When the oil is hot fry the slit green chillies till it turns white. 6. 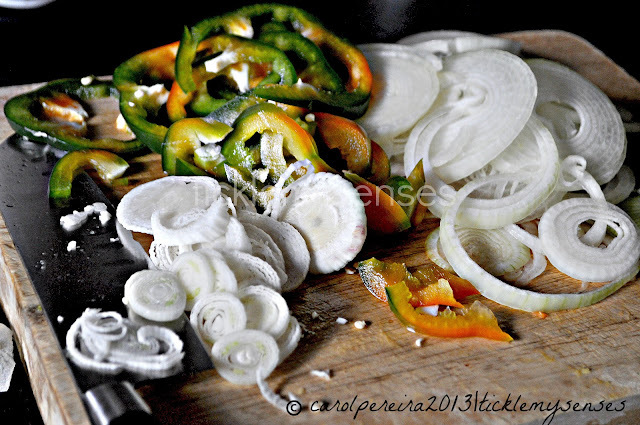 Add rest of slicings ( onions, capsicums, garlic) and stir fry on a high flame till almost soft but still slightly crunchy. 7. 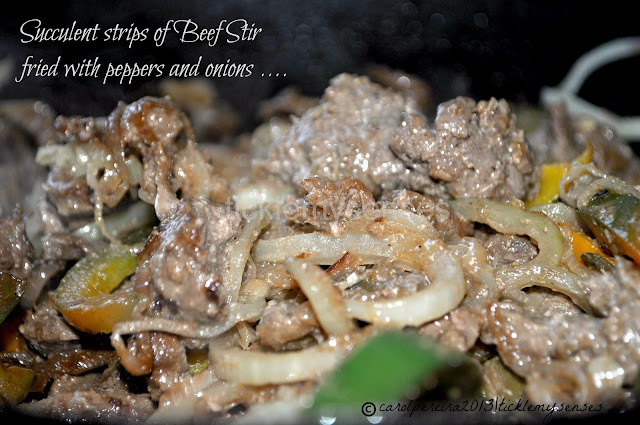 Add the cooked beef and stir fry for another 2 minutes. Sprinkle over pepper powder, add the soy sauce and lemon juice. Toss well. Taste for seasonings and adjust salt if required. Serve hot with a bowl of plain white rice or tossed noodles. 1. Most beef back home in India tends to be tough hence needs to be pressure cooked to tenderise prior to stir frying. The yoghurt and or tenderiser/ raw papaya(optional) paste when used creates very tender meat. In the UK, the cut of meat specially available for stir frying is very tender and cooks very quickly, hence I simply place the marinaded beef without any juices to a hot wok with a little oil and cook on a high heat for a couple of minutes till done. I seperately stir fry the vegetable in the wok and then toss them both together and add the seasonings. However if using any other cut of beef I prefer to use the pressure cooker to precook the meat prior to stir frying. Thank u am def..tryin this today....!!!!!!!!!!! One of the best recipes..it tasted as the ones i have had in manglorean homes.